This page concerns 2013 research. The news release relating to the 2015 Communications Market Report is available here. 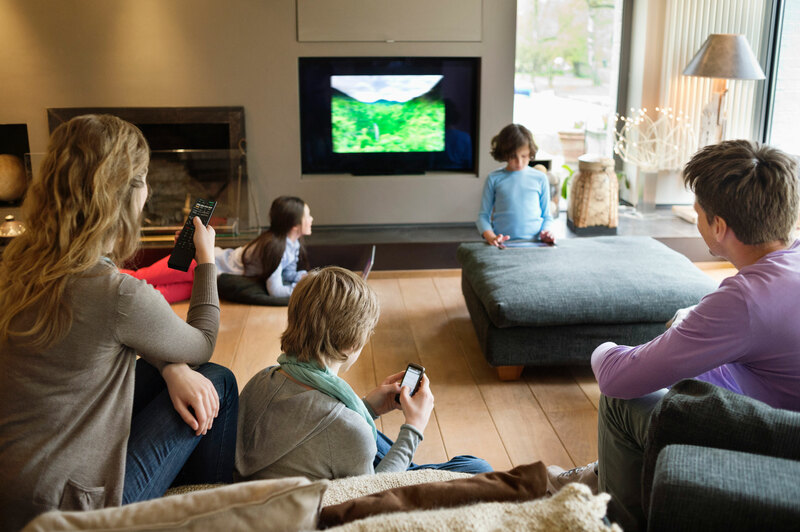 Huge growth in take-up of smartphones and tablets is creating a nation of media multi-taskers, Ofcom research reveals, transforming the traditional living room of our parents and grandparents into a digital media hub. 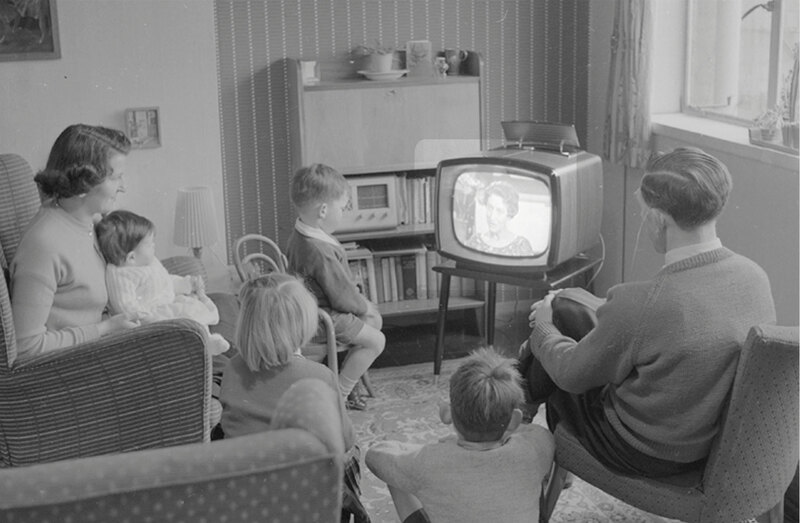 Ofcom's Communications Market Report 2013 reveals that people are still coming together to watch TV in the living room - 91% of UK adults view TV on the main set each week, up from 88% in 2002. However, an increasing array of digital media are now vying for their attention. People are streaming videos, firing off instant messages and updating their social media status - all while watching more TV than before. These activities are mostly carried out using smartphones, with over half of adults (51%) now owning these devices, almost double the proportion two years ago (27%). At the same time, tablet ownership has more than doubled in the past year, rising from 11% of homes to 24%. The average household now owns more than three types of internet enabled device, with one in five owning six or more. Over half (53%) of UK adults are now media multi-tasking while watching TV on a weekly basis. Watching other content on a different device is one of these activities. A quarter (25%) are regularly 'media meshing' - doing something else but related to what they're watching on TV. Examples of media meshing include talking on the phone (16%) or texting (17%) about what they're watching, using social networks (11%) or 'apps' to communicate directly with programmes (3%). 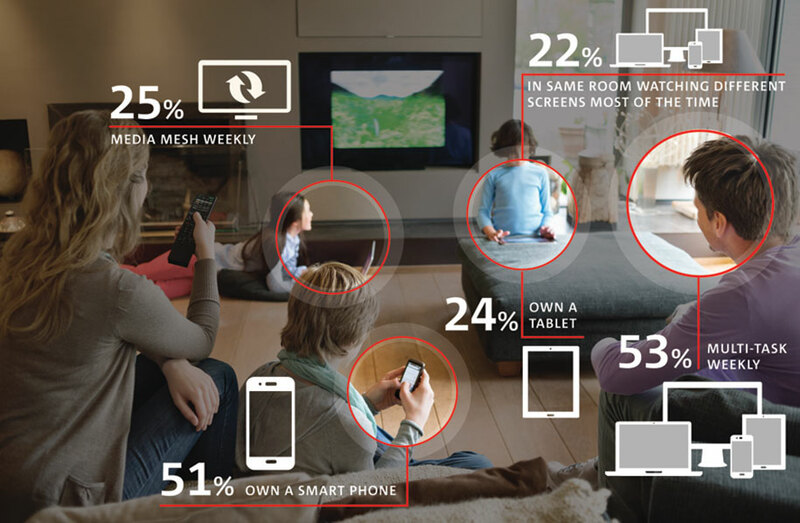 Younger people are most likely to use other media while watching TV (74%) with 44% media meshing. The impact of media meshing was seen during the 2013 Wimbledon Men’s tennis final, with 1.1 million people worldwide tweeting 2.6 million times using hashtags associated with the tennis final. Of these tweets, around 80% came from mobile devices 3. The other major social phenomenon driven by digital devices is 'media stacking'. Half (49%) of people use their smartphones and tablets for completely unrelated activities while watching TV every week - such as surfing the net (36%), social networking (22%) or online shopping (16%). Women are significantly more likely to media multi-task weekly (56% compared to 51% of men), as are those with children at home (66%). While the average household owns at least three types of internet-enabled device, the TV set in the living room retains its importance. People are increasingly reverting to having just one TV in their household - 41% of households in 2012 compared with 35% in 2002. In the first quarter of 2013, half (52%) of 5-15 year olds had a TV in their bedroom. This compares to seven in ten (69%) in 2007. And the proportion of UK adults viewing via the main TV set has increased from 88% in 2002 to 91% in 2012. Live TV accounted for 90% of all viewing in 2012, with the average viewer watching just over four hours of TV a day - 15 minutes more than in 2008. Viewers are also enjoying bigger screens in the living room. 'Jumbo' TV sets (43"+) accounted for 15.8% of sales in the first quarter 2013, a 4.3 percentage point increase on 2012. Tablets are also supporting the continued popularity of watching TV live, with more than half (57%) of tablet audiovisual content viewers watching live TV at least weekly via this device. 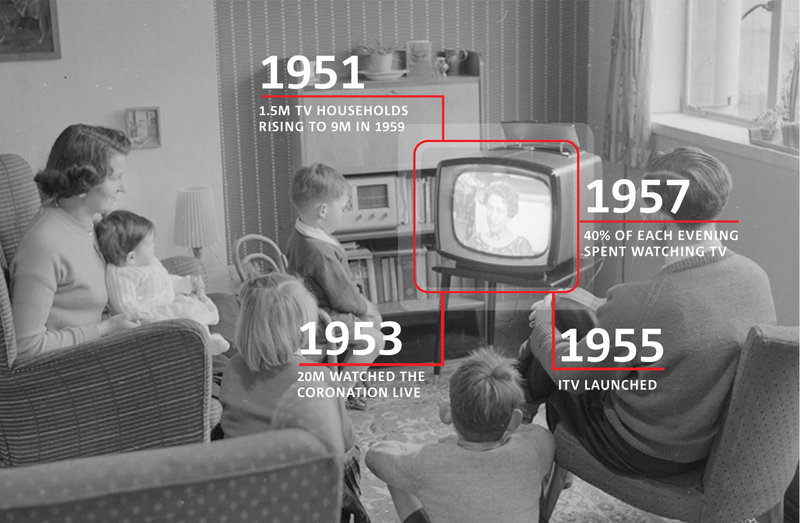 James Thickett, Ofcom's Director of Research, said: "Our research shows that increasingly families are gathering in the living room to watch TV just as they were in the 1950s - but now delivered on bigger, wider and more sophisticated sets. Unlike the 1950s family, however, they are also doing their own thing. They are tweeting about a TV show, surfing the net or watching different content altogether on a tablet. "Just a few years ago, we would be talking about last night’s TV at work or at school. Now, we're having those conversations live while watching TV - using social media, text and instant messaging." Household take-up of tablet computers has more than doubled over the past year, rising from 11% last year to 24% in 2013. Two-thirds of users say they use this device on a daily basis and 95% use it at least once a week. Weekly users say they spend an hour and 45 minutes each day using their tablet. One in ten (9%) households own more than one tablet and half of owners say they couldn't live without them, up from 34% last year. A third of tablet users say the device is their main way of connecting to the internet - on a par with the laptop. The growth in ownership of tablets is driving the use of second screens, and enticing people to the main TV room. More than half (56%) of tablet owners use their device for viewing audiovisual content and half of these do so while in the living room. Furthermore, a fifth of families with a tablet (22%) said they watch different content on different screens while in the same room all or most of the time. In addition to fuelling media multi-tasking in the living room, among people who watch audio visual content on their tablet, 60% do so in the bedroom. One in ten (11%) watch content in the bathroom, rising to 20% of 18-24 year olds. More than half (56%) of tablet users watch audiovisual content on the device, while half say they have downloaded at least one TV 'app' such as BBC iPlayer, ITV Player, 4OD, and Demand 5. Many parents are using tablet devices to keep their children occupied - three-quarters agree that their tablet is a useful tool for entertaining and educating their children. The majority (91%) of parents with a tablet say their children use it or have one of their own. Two in five (41%) report daily tablet use by their children - 17% say that their children use it more than once a day. TV-type viewing on tablets by children tends to take place in the same room as the main TV or in their bedroom. Among children, tablet computers are largely used for entertainment purposes. Playing games is most popular (71%), followed by watching short video clips (44%), internet browsing (40%) and watching TV programmes/films (37%). Around one in three parents with a tablet (28%) say that their child uses it for school or college work. Web-based forms of communication, such as email, instant messaging or social networking is now the most popular method of communication among younger people. More than eight in ten 16-24 year olds (84%) use at least one of these methods on weekly basis - higher than texting on a mobile phone (80%). The most popular forms of weekly web-based communication among this age group are social networking (66%) and instant messaging (48%). Individually, each of these methods is used less on a weekly basis than SMS. Around a third (35%) use micro-blogging sites on a weekly basis. Younger people are also more likely than older users to think it acceptable to share information via text. While 39% of all UK adults think that it acceptable to share good news through public text communication methods - such as posting on open social networking sites - this rises to 61% of 16-24 year olds. One in five (21%) 16-24 year olds also agree that it is acceptable to start a relationship by text messages, emails or personal messages on social networking sites. Similarly, 30% of 16-24 year olds agree that it is acceptable to have an argument by text. Superfast broadband (speeds of over 30 Mbit/s) is now available to almost three-quarters of UK premises. Just under a fifth (17.5%) of all fixed broadband connections were superfast at the end of March 2013, with subscribers doubling from 1.9 million to 3.8 million in the nine months to March 2013. Thirty per cent of consumers said value for money was the main consideration when selecting their superfast provider. The most notable way users said it had changed their internet use was to increase the amount of TV programmes and full-length films they were streaming. Furthermore, over half of superfast broadband users say they now work at home more than they used to. Seventy-two per cent of respondents said that they had increased their levels of streaming high-definition content since switching to a superfast service, while 64% had increased streaming of standard-definition content. The same proportion reported increased use of 'cloud' services - where files and content are stored digitally rather than on hardware in the consumer's home. In 2013, almost eight in ten (79%) superfast broadband users said the download speeds provided by their service had met or exceeded their expectations when they purchased the service. Over the past five years the average monthly household spend on communications services has fallen from £122.42 in 2007 to £113.51 in 2012. This represents a monthly saving of £8.91, or £106.92 per year. Total UK TV industry revenues increased by 0.8% year on year in 2012, reaching £12.3bn. This was driven by increases in subscriptions (up 0.9%) but a decline in TV advertising (down 2%). Online TV revenue in the UK increased 12-fold in the last five years, from £21m in 2007 to £258m in 2012. Year on year, the total market grew by 40%. Seven per cent of TV households had a Smart TV at the end of the Q1 2013, a two percentage point increase on the previous year. Of those who own a Smart TV, 77% have used the internet connection. Total UK radio industry revenues reached £1.19bn in 2012, an increase of 2.8% year on year. The reach of radio remains high; on average, 90% of the UK adult population tuned in to the radio each week in the 12 months to Q1 2013. This represents a 0.9 percentage point decrease year on year. On average, radio listeners spent 2 hours 50 minutes per day listening to the radio. Between 2007 and 2012, time spent listening fell by 3.1%. This is more pronounced in the 15-24 age group, where the time spent listening has fallen by 12.8% over the same period. Listening to the radio on digital devices has increased to 34.3% of total listening, a 5.1 percentage point increase on last year. The proportion of radio listeners with a DAB radio set in the home grew to 44%. Radio listening on a mobile phone has risen from 13% to 20% over the past year. Total UK telecoms revenues decreased by 1.8% in 2012 to £38.8bn. Over a million new fixed broadband connections were added in 2012. Three quarters (75%) of adults have access to a fixed or mobile broadband connection at home. More than half (53%) of active mobile subscribers were on contracts at the end of 2012, up from 49% in 2011. Eighty per cent of UK adults have access to the internet at home via a fixed or mobile broadband connection or via a mobile handset. Laptop and desktop internet users spend at least 35 hours online each month. Men spent the most time browsing online, especially those aged between 25 and 34, who spent an average 47 hours and 42 minutes online per month in April 2013. A fifth of mobile internet users have purchased goods or services from their phone, increasing five percentage points to 21% between April 2012 and April 2013. Of the activities relating to retail that mobile internet users were asked about, the most popular was using their handset to find a retailers’ location (25%). In 2012, total mail revenues grew by 7% to £7.2bn. Mail volumes continued to fall in 2012, declining 5.9% to 15.7 billion items. This is a 27.3% decline since 2007. Access mail volumes have continued to grow, and access now accounts for almost half (46%) of total mail volumes. Two-fifths of those that send mail have sent a parcel in the last month. Over a third (34%) of adults who have received post in the last week say that they have received at least one parcel. Almost two thirds of UK adults with broadband have bought goods online. Almost a third of adults are influenced by the delivery options offered by a retailer before buying online. A quarter (25%) of shoppers say that the cost of delivery has stopped them from buying in the past and six out of ten (59%) shoppers say that free delivery influences their choice of delivery option. Almost two thirds of adults say that they are reliant on post as a form of communication (64%). Around one in ten (13%) say that they use post to communicate with friends and family on a weekly basis. The use of mobile phones to access the internet grew faster in Scotland than in any other UK nation over the last year, rising 13 percentage points to 44%. Northern Ireland has the highest tablet computer ownership in the UK with the proportion of households owning a tablet more than trebling in the past year. Three in ten homes (29%) now own one, compared with 24% in the UK. Nearly a quarter of homes in Wales are shunning the traditional landline and using only mobile phones to make and receive calls at home. Twenty-three per cent of households in Wales are mobile-only, significantly more than the UK average of 15 per cent. The news releases for the Nations Communications Market Reports can be found here. Ofcom's Communications Market Report provides an overview of communications services across the UK and monitors key trends in the availability and take-up of digital services across the nation. Face-to-face surveys were conducted with 3,750 respondents aged 16+ in the UK. In addition to the survey data, this report refers to data from a range of other sources, including data provided to Ofcom by stakeholders. Media meshing is conducting activities or communicating via other devices while watching TV; these activities are related to the TV programme being watched. Media stacking is conducting activities or communicating via other devices while watching TV; but these activities are not related to the TV programme being watched. Combined, they make up media multi-tasking. Under the Communications Act 2003 (the Act), Ofcom is required to research markets constantly and to remain at the forefront of technological understanding. Ofcom is also required under section 358 of the Act to publish an annual factual and statistical report. Fast facts relating to the CMR can be found here. Slides from the media briefing can be found here. Contact the Ofcom Media Office for higher resolution versions. Four short video clips of James Thickett (Ofcom’s Director of Research and Market Intelligence) and Jane Rumble (Ofcom’s Head of Media Research and Intelligence) can be seen here. Contact the Ofcom Media Office for high resolution versions.